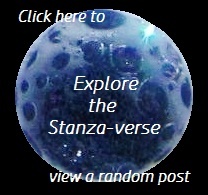 the ties (or glues) that bind | What Rhymes with Stanza? There’s been no holiday baking in my kitchen this year. Counter tops and back splashes are ripped out, the range is covered with a paint tarp, wires dangle where light fixtures used to hang… and in general it looks as though Home Depot exploded all over the kitchen. I can’t seem to remember in which boxes I packed which things to store out of the way for the kitchen remodel, and I couldn’t find any tape to secure the wrapping paper on Christmas gifts. Not to worry, though. Wood glue and trigger clamps did the trick nicely. My dog Chules got a nice treat from Santa Paws. Judging by his newly acquired black snout, I’m guessing the treat is now buried somewhere in the dirt of the back yard. My cat Sebastian got some goodies from Santa Claws as well, but judging from his glazed stare, it looks like maybe he dipped into the egg nog when I wasn’t looking. I’ve had a wonderful day spent with my beautiful family, eating great food (obviously not prepared in my kitchen), sharing good memories and creating lovely new ones. I hope your holidays are as blessed as mine! This entry was posted in Animalia, Photography and tagged cat, Christmas, dog, holidays, kitchen remodel, pets, presents. Bookmark the permalink. I think so. But now they’re gearing up for a New Years Eve sleepover with Bella. It’s just one big party for those fur kids.